All this about Greens, I mean collards greens down south in Mississippi, Alabama and Georgia where the greens grow. This is a new twist in cooking collard greens, with cornmeal dumplings. Meaning bread in the pot! Cornbread that is already to enjoy. You can choose the meat you like, whether it is ham hock or salt pork, you cannot go wrong in the South. 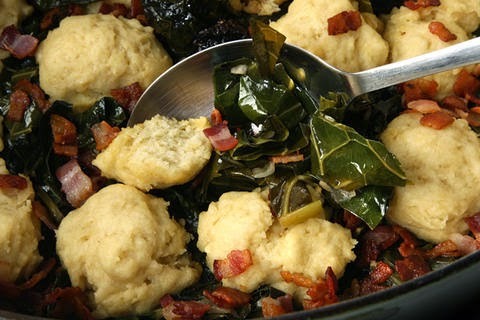 enjoy the pot liquor of the collard greens in the cornbread dumplings.Yum!!!! Dutch oven or a large pot add water,oil and ham hocks and Cook 45 mins. add collard green stirring occasionally, about 15 to 20 minutes. Add the onion, garlic, chiles, and measured salt and pepper and cook, stirring occasionally, until the collard is tender. whisk together flour, cornmeal, brown sugar, baking powder, and 1/4 teaspoon salt, then blend in butter well with your fingertips. Stir in milk until just combined. Let dough stand 5 minutes. With wet hands, roll rounded tablespoons of dough into balls. Gently place dumplings on top of greens. Cook, covered and undisturbed, over low heat until greens are very tender and silky and dumplings are puffed and cooked through, about 20 minutes. Sprinkle the greens with the reserved bacon and serve immediately.